West Ham manager Avram Grant will be sacked if he fails to secure a win in one of the struggling side's next three league games, BBC sport understands. The 55-year-old has only one win in 11 Premier League matches, leaving the relegation-threatened club three points adrift at the bottom of the table. It is understood Sam Allardyce, sacked by Blackburn this week, is being considered as a replacement. West Ham next travel to Blackburn and Fulham before a home game with Everton. Vice-chairman Karren Brady told BBC Sport a month ago that Grant would "almost definitely" remain in charge at the end of the season and the club are likely to invest in new players during the January transfer window. But a source said replacing the Israeli if he fails to meet the terms of the ultimatum would allow the club to make best use of the transfer window, giving the new manager "a chance to make the changes he wanted". After narrowly avoiding relegation last season West Ham sacked former manager Gianfranco Zola and signed former Portsmouth boss Grant on a four-year contract. If we DO win just one out of three, we will have played 20 games and secured 15 points and STILL be bottom of the league! Despite sweeping aside Manchester United in the Carling Cup, defeats by Sunderland and Manchester City mean the club have collected only 12 points from 17 league matches. Grant has faced an injury crisis at Upton Park, deprived of the services of Jack Collison, Thomas Hitzlsperger, Valon Behrami, Kieron Dyer, Carlton Cole and Mark Noble for significant periods of the season. In addition, several of his players are out of contract at the end of the season. The club's owners David Gold and David Sullivan are sympathetic to Grant, but are aware only once in 18 years of the Premier League has a team bottom at Christmas survived the drop. 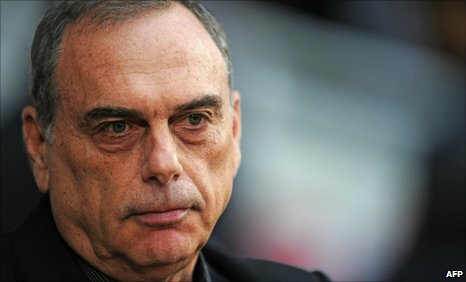 "Dismissing Avram is not something the board wants to do," said the source. "The club are aware that we were lucky to avoid relegation last season, and that Avram inherited a 'Championship-rate' squad. "He's also had a dreadful run of injuries, but we can't get to the beginning of the window and not do something if things don't improve." Survival specialist Allardyce has an unparalleled track record in digging clubs out of trouble. He took over Rovers when they were 19th in the table and kept them in the Premier League. In November, assistant boss Zeljko Petrovic departed the club and Wally Downes was brought in as a defensive coach a day later.